Neural networks are used as a method of deep learning, one of the many subfields of artificial intelligence. They were first proposed around 70 years ago as an attempt at simulating the way the human brain works, though in a much more simplified form. Individual ‘neurons’ are connected in layers, with weights assigned to determine how the neuron responds when signals are propagated through the network. Previously, neural networks were limited in the number of neurons they were able to simulate, and therefore the complexity of learning they could achieve. But in recent years, due to advancements in hardware development, we have been able to build very deep networks, and train them on enormous datasets to achieve breakthroughs in machine intelligence. These breakthroughs have allowed machines to match and exceed the capabilities of humans at performing certain tasks. One such task is object recognition. Though machines have historically been unable to match human vision, recent advances in deep learning have made it possible to build neural networks which can recognize objects, faces, text, and even emotions. In this tutorial, you will implement a small subsection of object recognition—digit recognition. 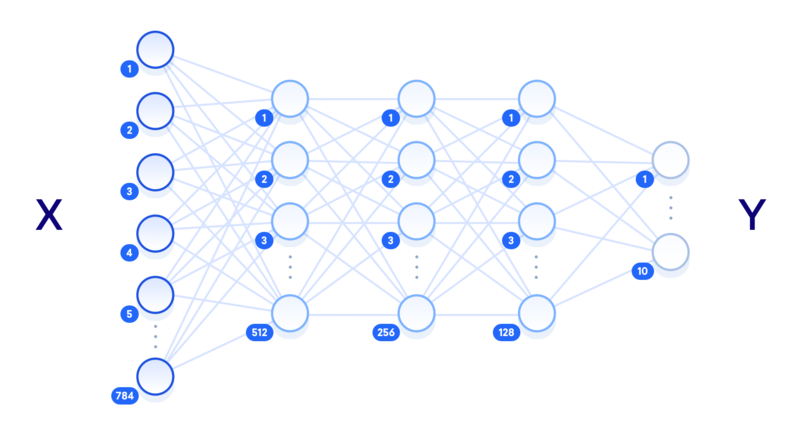 Using TensorFlow, an open-source Python library developed by the Google Brain labs for deep learning research, you will take hand-drawn images of the numbers 0-9 and build and train a neural network to recognize and predict the correct label for the digit displayed. While you won’t need prior experience in practical deep learning or TensorFlow to follow along with this tutorial, we’ll assume some familiarity with machine learning terms and concepts such as training and testing, features and labels, optimization, and evaluation. You can learn more about these concepts in An Introduction to Machine Learning. Before you can develop the recognition program, you’ll need to install a few dependencies and create a workspace to hold your files. With the dependencies installed, we can start working on our project. When reading in the data, we are using one-hot-encoding to represent the labels (the actual digit drawn, e.g. "3") of the images. One-hot-encoding uses a vector of binary values to represent numeric or categorical values. As our labels are for the digits 0-9, the vector contains ten values, one for each possible digit. One of these values is set to 1, to represent the digit at that index of the vector, and the rest are set to 0. For example, the digit 3 is represented using the vector [0, 0, 0, 1, 0, 0, 0, 0, 0, 0]. As the value at index 3 is stored as 1, the vector therefore represents the digit 3. To represent the actual images themselves, the 28x28 pixels are flattened into a 1D vector which is 784 pixels in size. Each of the 784 pixels making up the image is stored as a value between 0 and 255. This determines the grayscale of the pixel, as our images are presented in black and white only. So a black pixel is represented by 255, and a white pixel by 0, with the various shades of gray somewhere in between. Now that we have our data imported, it’s time to think about the neural network. The architecture of the neural network refers to elements such as the number of layers in the network, the number of units in each layer, and how the units are connected between layers. As neural networks are loosely inspired by the workings of the human brain, here the term unit is used to represent what we would biologically think of as a neuron. Like neurons passing signals around the brain, units take some values from previous units as input, perform a computation, and then pass on the new value as output to other units. These units are layered to form the network, starting at a minimum with one layer for inputting values, and one layer to output values. The term hidden layer is used for all of the layers in between the input and output layers, i.e. those "hidden" from the real world. Different architectures can yield drastically different results, as the performance can be thought of as a function of the architecture among other things, such as the parameters, the data, and the duration of training. The term "deep neural network" relates to the number of hidden layers, with "shallow" usually meaning just one hidden layer, and "deep" referring to multiple hidden layers. Given enough training data, a shallow neural network with a sufficient number of units should theoretically be able to represent any function that a deep neural network can. But it is often more computationally efficient to use a smaller deep neural network to achieve the same task that would require a shallow network with exponentially more hidden units. Shallow neural networks also often encounter overfitting, where the network essentially memorizes the training data that it has seen, and is not able to generalize the knowledge to new data. This is why deep neural networks are more commonly used: the multiple layers between the raw input data and the output label allow the network to learn features at various levels of abstraction, making the network itself better able to generalize. The learning rate represents ow much the parameters will adjust at each step of the learning process. These adjustments are a key component of training: after each pass through the network we tune the weights slightly to try and reduce the loss. Larger learning rates can converge faster, but also have the potential to overshoot the optimal values as they are updated. The number of iterations refers to how many times we go through the training step, and the batch size refers to how many training examples we are using at each step. The dropout variable represents a threshold at which we elimanate some units at random. We will be using dropout in our final hidden layer to give each unit a 50% chance of being eliminated at every training step. This helps prevent overfitting. We have now defined the architecture of our neural network, and the hyperparameters that impact the learning process. The next step is to build the network as a TensorFlow graph. To build our network, we will set up the network as a computational graph for TensorFlow to execute. The core concept of TensorFlow is the tensor, a data structure similar to an array or list. initialized, manipulated as they are passed through the graph, and updated through the learning process. The only parameter that needs to be specified at its declaration is the size of the data we will be feeding in. For X we use a shape of [None, 784], where None represents any amount, as we will be feeding in an undefined number of 784-pixel images. The shape of Y is [None, 10] as we will be using it for an undefined number of label outputs, with 10 possible classes. The keep_prob tensor is used to control the dropout rate, and we initialize it as a placeholder rather than an immutable variable because we want to use the same tensor both for training (when dropout is set to 0.5) and testing (when dropout is set to 1.0). The parameters that the network will update in the training process are the weight and bias values, so for these we need to set an initial value rather than an empty placeholder. These values are essentially where the network does its learning, as they are used in the activation functions of the neurons, representing the strength of the connections between units. Each hidden layer will execute matrix multiplication on the previous layer’s outputs and the current layer’s weights, and add the bias to these values. At the last hidden layer, we will apply a dropout operation using our keep_prob value of 0.5. The final step in building the graph is to define the loss function that we want to optimize. A popular choice of loss function in TensorFlow programs is cross-entropy, also known as log-loss, which quantifies the difference between two probability distributions (the predictions and the labels). A perfect classification would result in a cross-entropy of 0, with the loss completely minimized. We've now defined the network and built it out with TensorFlow. The next step is to feed data through the graph to train it, and then test that it has actually learnt something. The training process involves feeding the training dataset through the graph and optimizing the loss function. Every time the network iterates through a batch of more training images, it updates the parameters to reduce the loss in order to more accurately predict the digits shown. The testing process involves running our testing dataset through the trained graph, and keeping track of the number of images that are correctly predicted, so that we can calculate the accuracy. In correct_pred, we use the arg_max function to compare which images are being predicted correctly by looking at the output_layer (predictions) and Y (labels), and we use the equal function to return this as a list of [Booleans](tps://www.digitalocean.com/community/tutorials/understanding-data-types-in-python-3#booleans). We can then cast this list to floats and calculate the mean to get a total accuracy score. At each training step, the parameters are adjusted slightly to try and reduce the loss for the next step. As the learning progresses, we should see a reduction in loss, and eventually we can stop training and use the network as a model for testing our new data. After 100 iterations of each training step in which we feed a mini-batch of images through the network, we print out the loss and accuracy of that batch. Note that we should not be expecting a decreasing loss and increasing accuracy here, as the values are per batch, not for the entire model. We use mini-batches of images rather than feeding them through individually to speed up the training process and allow the network to see a number of different examples before updating the parameters. Once the training is complete, we can run the session on the test images. This time we are using a keep_prob dropout rate of 1.0 to ensure all units are active in the testing process. To try and improve the accuracy of our model, or to learn more about the impact of tuning hyperparameters, we can test the effect of changing the learning rate, the dropout threshold, the batch size, and the number of iterations. We can also change the number of units in our hidden layers, and change the amount of hidden layers themselves, to see how different architectures increase or decrease the model accuracy. To demonstrate that the network is actually recognizing the hand-drawn images, let's test it on a single image of our own. First either download this sample test image or open up a graphics editor and create your own 28x28 pixel image of a digit. Open the main.py file in your editor and add the following lines of code to the top of the file to import two libraries necessary for image manipulation. The open function of the Image library loads the test image as a 4D array containing the three RGB color channels and the Alpha transparency. This is not the same representation we used previously when reading in the dataset with TensorFlow, so we'll need to do some extra work to match the format. First, we use the convert function with the L parameter to reduce the 4D RGBA representation to one grayscale color channel. We store this as a numpy array and invert it using np.invert, because the current matrix represents black as 0 and white as 255, whereas we need the opposite. Finally, we call ravel to flatten the array. Now that the image data is structured correctly, we can run a session in the same way as previously, but this time only feeding in the single image for testing. Add the following code to your file to test the image and print the outputted label. The np.squeeze function is called on the prediction to return the single integer from the array (i.e. to go from  to 2). The resulting output demonstrates that the network has recognized this image as the digit 2. You can try testing the network with more complex images –– digits that look like other digits, for example, or digits that have been drawn poorly or incorrectly –– to see how well it fares. In this tutorial you successfully trained a neural network to classify the MNIST dataset with around 92% accuracy and tested it on an image of your own. Current state-of-the-art research achieves around 99% on this same problem, using more complex network architectures involving convolutional layers. These use the 2D structure of the image to better represent the contents, unlike our method which flattened all the pixels into one vector of 784 units. You can read more about this topic on the TensorFlow website, and see the research papers detailing the most accurate results on the MNIST website. Now that you know how to build and train a neural network, you can try and use this implementation on your own data, or test it on other popular datasets such as the Google StreetView House Numbers, or the CIFAR-10 dataset for more general image recognition. An important part of managing server configuration and infrastructure includes maintaining an easy way to look up network interfaces and IP addresses by name, by setting up a proper Domain Name System (DNS). Using fully qualified domain names (FQDNs), instead of IP addresses, to specify network addresses eases the configuration of services and applications, and increases the maintainability of configuration files. Setting up your own DNS for your private network is a great way to improve the management of your servers. In this tutorial, we will go over how to set up an internal DNS server, using the BIND name server software (BIND9) on Debian 9, that can be used by your servers to resolve private hostnames and private IP addresses. This provides a central way to manage your internal hostnames and private IP addresses, which is indispensable when your environment expands to more than a few hosts. On each of these servers, configure administrative access via a sudo user and a firewall by following our Debian 9 initial server setup guide. If you are unfamiliar with DNS concepts, it is recommended that you read at least the first three parts of our Introduction to Managing DNS. We have two servers which will be designated as our DNS name servers. We will refer to these as ns1 and ns2 in this guide. We have two additional client servers that will be using the DNS infrastructure we create. We will call these host1 and host2 in this guide. You can add as many as you’d like for your infrastructure. All of these servers exist in the same datacenter. We will assume that this is the nyc3 datacenter. All of these servers have private networking enabled (and are on the 10.128.0.0/16 subnet. You will likely have to adjust this for your servers). All servers are connected to a project that runs on “example.com”. Since our DNS system will be entirely internal and private, you do not have to purchase a domain name. However, using a domain you own may help avoid conflicts with publicly routable domains. Your existing setup will be different, but the example names and IP addresses will be used to demonstrate how to configure a DNS server to provide a functioning internal DNS. You should be able to easily adapt this setup to your own environment by replacing the host names and private IP addresses with your own. It is not necessary to use the region name of the datacenter in your naming scheme, but we use it here to denote that these hosts belong to a particular datacenter’s private network. If you utilize multiple datacenters, you can set up an internal DNS within each respective datacenter. By the end of this tutorial, we will have a primary DNS server, ns1, and optionally a secondary DNS server, ns2, which will serve as a backup. Let’s get started by installing our Primary DNS server, ns1. Text that is highlighted in red is important! It will often be used to denote something that needs to be replaced with your own settings or that it should be modified or added to a configuration file. For example, if you see something like host1.nyc3.example.com, replace it with the FQDN of your own server. Likewise, if you see host1_private_IP, replace it with the private IP address of your own server. Now that BIND is installed, let's configure the primary DNS server. BIND's configuration consists of multiple files, which are included from the main configuration file, named.conf. These filenames begin with named because that is the name of the process that BIND runs (short for "domain name daemon"). We will start with configuring the options file. When you are finished, save and close the named.conf.options file. The above configuration specifies that only your own servers (the "trusted" ones) will be able to query your DNS server for outside domains. Next, we will configure the local file, to specify our DNS zones. Aside from a few comments, the file should be empty. Here, we will specify our forward and reverse zones. DNS zones designate a specific scope for managing and defining DNS records. Since our domains will all be within the "nyc3.example.com" subdomain, we will use that as our forward zone. Because our servers' private IP addresses are each in the 10.128.0.0/16 IP space, we will set up a reverse zone so that we can define reverse lookups within that range. The forward zone file is where we define DNS records for forward DNS lookups. That is, when the DNS receives a name query, "host1.nyc3.example.com" for example, it will look in the forward zone file to resolve host1's corresponding private IP address. Next, delete the three records at the end of the file (after the SOA record). If you're not sure which lines to delete, they are marked with a "delete this line" comment above. Save and close the db.nyc3.example.com file. Now let's move onto the reverse zone file(s). Reverse zone files are where we define DNS PTR records for reverse DNS lookups. That is, when the DNS receives a query by IP address, "10.128.100.101" for example, it will look in the reverse zone file(s) to resolve the corresponding FQDN, "host1.nyc3.example.com" in this case. Now delete the two records at the end of the file (after the SOA record). If you're not sure which lines to delete, they are marked with a "delete this line" comment above. Save and close the reverse zone file (repeat this section if you need to add more reverse zone files). We're done editing our files, so next we can check our files for errors. If your named configuration files have no syntax errors, you will return to your shell prompt and see no error messages. If there are problems with your configuration files, review the error message and the "Configure Primary DNS Server" section, then try named-checkconf again. The named-checkzone command can be used to check the correctness of your zone files. Its first argument specifies a zone name, and the second argument specifies the corresponding zone file, which are both defined in named.conf.local. When all of your configuration and zone files have no errors in them, you should be ready to restart the BIND service. Your primary DNS server is now setup and ready to respond to DNS queries. Let's move on to creating the secondary DNS server. In most environments, it is a good idea to set up a secondary DNS server that will respond to requests if the primary becomes unavailable. Luckily, the secondary DNS server is much easier to configure. Save and close the named.conf.options file. This file should look exactly like ns1's named.conf.options file except it should be configured to listen on ns2's private IP address. Now save and close the named.conf.local file. Now you have primary and secondary DNS servers for private network name and IP address resolution. Now you must configure your client servers to use your private DNS servers. Before all of your servers in the "trusted" ACL can query your DNS servers, you must configure each of them to use ns1 and ns2 as name servers. This process varies depending on OS, but for most Linux distributions it involves adding your name servers to the /etc/resolv.conf file. On Ubuntu 18.04, networking is configured with Netplan, an abstraction that allows you to write standardized network configuration and apply it to incompatible backend networking software. To configure DNS, we need to write a Netplan configuration file. In this example, the private interface is eth1. Note: Netplan uses the YAML data serialization format for its configuration files. Because YAML uses indentation and whitespace to define its data structure, make sure that your definition uses consistent indentation to avoid errors. If the countdown is updating correctly at the bottom, the new configuration is at least functional enough to not break your SSH connection. Press ENTER to accept the new configuration. Your client should now be configured to use your internal DNS servers. Your client is now configured to use your DNS servers. The command may hang for a few seconds, but should return you to the prompt shortly. Your client should now be able to connect to and use your DNS servers. Use nslookup to test if your clients can query your name servers. You should be able to do this on all of the clients that you have configured and are in the "trusted" ACL. We can start by performing a forward lookup. Next, we can check reverse lookups. If all of the names and IP addresses resolve to the correct values, that means that your zone files are configured properly. If you receive unexpected values, be sure to review the zone files on your primary DNS server (e.g. db.nyc3.example.com and db.10.128). Congratulations! Your internal DNS servers are now set up properly! Now we will cover maintaining your zone records. Now that you have a working internal DNS, you need to maintain your DNS records so they accurately reflect your server environment. Forward zone file: Add an "A" record for the new host, increment the value of "Serial"
Reverse zone file: Add a "PTR" record for the new host, increment the value of "Serial"
Your primary server should be configured for the new host now. Your secondary server will now accept connections from the new host. If you remove a host from your environment or want to just take it out of DNS, just remove all the things that were added when you added the server to DNS (i.e. the reverse of the steps above). Now you may refer to your servers' private network interfaces by name, rather than by IP address. This makes configuration of services and applications easier because you no longer have to remember the private IP addresses, and the files will be easier to read and understand. Also, now you can change your configurations to point to a new servers in a single place, your primary DNS server, instead of having to edit a variety of distributed configuration files, which eases maintenance. Once you have your internal DNS set up, and your configuration files are using private FQDNs to specify network connections, it is critical that your DNS servers are properly maintained. If they both become unavailable, your services and applications that rely on them will cease to function properly. This is why it is recommended to set up your DNS with at least one secondary server, and to maintain working backups of all of them.